Prices quoted below are each way departing from the Chelmsford area. Please contact us for alternative collection points. 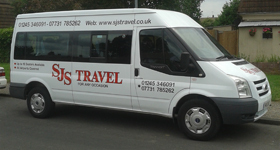 All prices are for up to 16 passengers. Coach park fees are applicable to Gatwick (£17), Heathrow (£29) Southend and London City (£5) and apply to return journeys only. 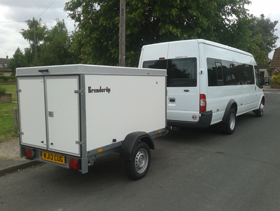 Luggage trailer included if required at no additional cost suitable for skis, golf clubs, suitcases etc. We require a mobile phone number and a return flight number when you book. Full payment is required on outward journey and to include any toll/parking fees. Please note we do not offer a self drive service. 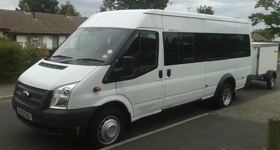 Chelmsford - Newmarket for up to 16 people - £340 return. Chelmsford - Romford Dogs for up to 16 people - £180 return. Chelmsford - Brighton for up to 16 people - £395 return. Chelmsford - Thorpe Park for up to 16 people - £395 return.